Mappings define how the JSON data indexed into appbase.io is stored as. Within an app, mappings are set for one mapping type which determines how the JSON documents get indexed. A mapping type contains a list of fields that are applicable to the indexed JSON data. Primitive: Text, Keyword, Integer, Float, Double, Date, Geo Point, Boolean are some examples. Array: An array shape in appbase.io is just a container that can hold one or more values of the primitive data type. There is no special data type associated with it. Object: An object shape in appbase.io acts as a container that can hold a nested JSON object, each keys of which representing a primitive data type or another object / array container. Beyond the primitive data types, there are also specialized data types that are specific to a search engine, like completion, ip, percolator. 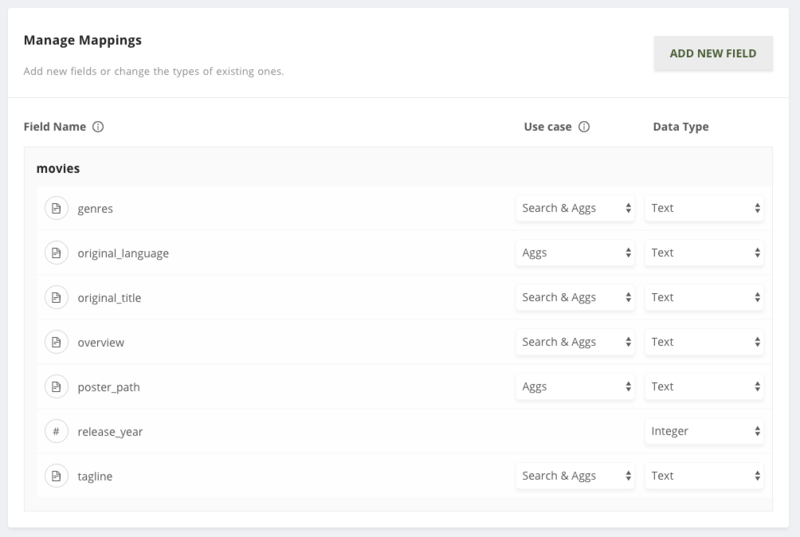 You can read all about the supported data types over here. There are three ways you can set mappings. Data Browser: The data browser UI can be used to set mappings via the Add New Field UI button. The UI supports adding all the primitive types. You can set your own mapping object for creating a specialized type or if you want to set any non-default options within a type. Manage Mappings: The Mappings UI can be used to Add New Field. REST API: You can use the APIs to set the mappings using the PUT /_mapping endpoint. Mappings are immutable in Elasticsearch. Once set, they can’t be changed. If you are on a paid plan on appbase.io, you can edit the mappings via the Mappings UI. As mappings are immutable, we provide this functionality by reindexing an app. Delete a field: This will also delete any associated data values being used for that field. Edit an individual field’s data type: This will change the associated data type of the field. 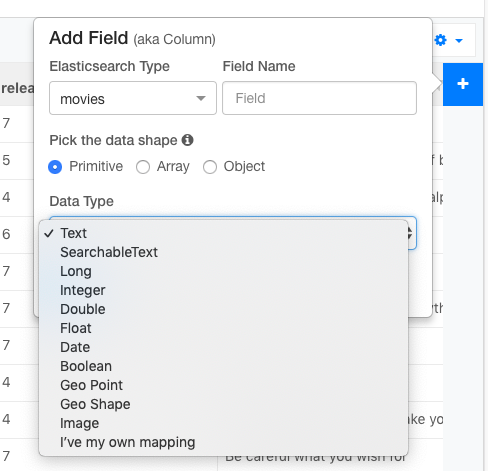 Delete a mapping type: This will delete all the fields (and their values) that belong under the mapping type. Add a new field: This allows you to add new field types. You can also now set the number of shards for your index from the GUI. This setting should be used carefully, although we provide a good set of defaults for you. Once you configure the shards, the data in your index is re-indexed. We create a new index with the updated shard setting, move your data to that index and update the app name alias to point to this new index and delete the old index. When you have a dataset that has more than 1 Million documents, we recommend splitting the app data into more shards. This optimizes the performance of the app by allowing us to have these shards better divided across the clusters.